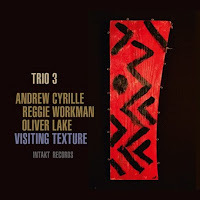 Three elder statesmen of avant-garde jazz—drummer Andrew Cyrille, altoist Oliver Lake, and bassist Reggie Workman—join together yet once more for what by my count is their 11th release. This one’s somewhat unusual in that it’s their first in-studio record in some time without special guests. In recent years they’ve teamed up with a number of in-demand pianists, such as Geri Allen, Vijay Iyer and Jason Moran, but here we’re treated to just the trio. And that’s all to the good, as the joy of listening to three masters of this music draw from their many years of partnership will be more than enough to satisfy most fans of these wily veterans. Aside from one Ornette Coleman cover (the lovely “A Girl Named Rainbow”), the group sticks to pieces penned by the trio: three from Lake, two from Cyrille, and one from Workman, along with a freely-improvised piece (suitably entitled “Composite”). The guys generally keep the music to a low boil, eschewing over-the-top acrobatics in favor of confident, well-paced, careful group expressions that invoke a deep, soulful lyricism. This is certainly characteristic of Lake, whose compositions on the first two tracks (“Bumper” and “Bonu”) feature his sharp-edged melodious sensibility, while Workman and Cyrille are adept in teasing, bending, and manipulating the pulse while never letting things spin out of their grasp. Even “Composite” manages to feel cohesive and purposeful despite its more freely-defined contours. Along with their remarkable rhythmic elasticity, it’s stunning just how musical Workman and Cyrille are in their contributions. Workman is a marvel at articulating phrases that resonate just as powerfully as Lake’s, and he can do this with clusters of notes as well as just a few sparsely placed ones. Listen to Workman’s tuneful lines dancing around the melody of “Bonu” for a perfect example; he complements Lake beautifully throughout the piece. His opening solo statement at the beginning of Cyrille’s “Epic Man” is brilliant in using both arco and pizzicato techniques to establish the brooding mood of the piece, and his communicative exchanges with Lake during the last half of the track are jaunty and delightful. And those familiar with Cyrille will recognize his astonishing ability to craft percussive statements that do so much more than keep time: they sing, proving once again what a percussionist of Cyrille’s caliber can accomplish with a drum kit. This is especially evident not simply on his solo statement, “7 for Max,” with rhythmic diversity and spontaneity in abundance, but on “Stick,” where he roams all over the cymbals, toms and snare in providing the roiling undercurrent to Workman and Lake as they generate some creative fire. There are plenty of young upstarts nowadays who will continue to drive this music forward in the years to come. But it’s always a pleasure to hear from the living legends too, especially when they’re still in such excellent form. Let’s hope these three will continue to stick around for a while. Wonderful review. Three masters doing what they do best. I am fixing to purchase this one. Thanks again my friend.